Should you spy or have to spy on your coworkers? Will that benefit or harm you or your company? What’s the rational thing to do when given the choice or pressure to spy and snitch? You may think that “it depends”. But you’re probably not thinking that it depends on what elementary mathematical game theory has to say about the costs, benefits, outcomes and rationality of snitching. However, what’s even more surprising is that the most “rational” thing to do when forced to choose between snitching and not snitching in this situation turns out to be the worst—and not just for you! This is what the following will prove. If you observe anything suspicious or concerning in the conversation, appearance, manner, associations, absences, desk photos, calendars, interests and hobbies, breath, bumper stickers or just about anything else pertaining to a coworker, you will get 1 “point” for reporting him or her to management. However, if, you fail to “snitch” when you believe you should, you will be docked one point, i.e., you will incur at least a 1-point penalty worth -1 units of “utility”, and lose a tenth of your income, get a lower job evaluation score or maybe even jail time. Note that this is not about failure to report when you “know you should”; it’s about failure to do so merely when you “believe you should”, since, after all, we are talking about suspicion, not conviction—and besides, waiting until you know, rather than merely believe, may be, as history and life frequently teach us, to wait too long. Hence, the astute reader will sense (unintentional?) management-applied encouragement of, if not pressure and a bias toward, filing “false positive” reports, rather than risk the “false negative” that silence and inaction may amount to. The same savvy reader will also note how the point scheme incentivizes snooping, prying, gossiping, Google Glassing and myriad other intrusions, since the difference, in this reward and punishment program, between reporting and failing to report is 2 points (+1 vs. -1), which can be substantial in this scheme of things. Worse than failing to report, is, of course, being reported. If you are “snitched on”, then, pending a formal investigation, related due process and some conclusion of the investigation, the new policy stipulates that you will incur a larger loss, of 3 points—which will probably be irrecoverable (short of litigation for damages). That’s simple enough: snitch, and you win one point; fail to snitch, and you lose one point; get snitched on, and you lose three points. So what happens when there are two coworkers snitching on each other? Do the math: 1 + (-3) = -2. Note that’s a net penalty of -2 for each of you. To make this policy scenario as simple as possible, assume the organization has only two employees, who apart from any nefarious plots they may be separately hatching (unbeknownst to each other), are “rational”—i.e., each wants to maximize his or her utility, a.k.a. payoffs, and make the smartest decisions (s)he can to accomplish that. That understood, what should they do—given that they cannot collude or confide in each other (lest they fall directly under management suspicion)? Basically, all they can do is guess, forget about it, or, perhaps better, spy and pry. To determine whether there is a most rational single strategy one or both of them should follow (as opposed to random decision-making), consider the grid diagram shown. Technically, this matrix represents a “strategic solution” of their “2-person game”. As can easily be demonstrated, it amazingly and unexpectedly turns out that, given the rules and payoffs of this new policy, the most rational decision each of them can make is to the one that leads to the worst outcome! In the language of game theory (brought to its first full fruition by John Von Neumann and Eric Morgenstern, in The Theory of Games and Economic Behavior), the worst strategy pair actually “dominates” the alternatives. 1. 1. Assume that, for whatever prior reason, you initially think snitching is the way to go, e.g., it guarantees praise and carries a reward of one point. Besides, being nosy is fun. Further assume that only you snitch. OK. Then you get the one point, while your coworker gets the 3-point penalty. That’s no problem, since you’ve convinced yourself he deserves it, even if only for appearing to be doing something suspicious. But now you notice something disturbing: If you don’t snitch on him, but he snitches on you, you get whacked with the 3-point penalty—your worst-case scenario, you think. This outcome is represented in the lower left quadrant of the grid, i.e., -3, in green for you, arbitrarily assigned to the left; +1 in maroon for your coworker, who is therefore assigned to the top of the grid. So, suddenly it’s clear to you, that things will be worse for you if you don’t snitch when your coworker does. That’s because -2 points, although not great, is a better result than -3. Ergo, you’d better snitch in case your coworker eventually does. 2. 2. But, suppose (s)he doesn’t snitch. A quick look at the grid shows that, again, you’d better snitch, since, when you snitch and (s)he doesn’t, you win one point; but if you don’t snitch when (s)he, again, doesn’t, you lose a point (just as your coworker does). Wow! So, no matter what your coworker does—snitch or not, you should snitch. You will either lose “only” 2 points (when (s)he also snitches) or gain one point (when (s)he doesn’t snitch). 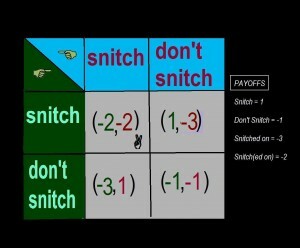 A quick look at the grid will show that if you take the other option and do not snitch, you will correspondingly lose 3 points and 1 point, both being worse outcomes that the consequences of your snitching. So your best decision is settled: snitch—no matter what. 3. 3. This is where things get weird: Now take a look at your coworker’s best option. Exactly the same result. If your coworker snitches and you do too, (s)he gets a guaranteed payoff of -2, which although negative, is not as bad as the -3 for his or her not snitching too. By the same token, if (s)he snitches and you don’t, again, the payoff is higher than it would be without snitching: Your coworker gains one point, instead of losing one. What makes all of this weird and relevant to a “do ask, do tell”, “pry and spy”, “or else!” policy is that the most rational choice under this kind of policy is the worst! That’s because, in the first place, for both of you there is a strategy with a better payoff than the “snitch-snitch” combination that the math and logic dictate: the commonsensically better one is the “don’t snitch-don’t snitch” combination, which costs each of you only one point, as opposed to the two points in a “snitch-snitch” combination. Secondly, from a total utility perspective that encompasses both of you, the “rational” choice, i.e., the strategic solution represents the greatest combined loss, namely, 4 points (in the top left quadrant, with the “victory” sign). The “better” choice, “don’t snitch-don’t snitch” costs a total of only 2 points. 1. The foregoing premises, stipulations, analysis and outcome are virtually identical with the now classic game-theory paradox of what is called the “prisoner’s dilemma”, in which two suspected criminals are, in isolation from each other, given the same offer: no jail time for being the only one to snitch on the other, but two years in the slammer if both snitch, and three years if only the other guy snitches. In that game too, the “best” deduced strategic choice, “snitch-snitch” (or “defect-defect”) results in the worst payoffs. The fundamental implication of both the “pry and spy” workplace and prisoner’s dilemma scenarios is that in circumstances such as these, the two “players” will, if “rational”, not help each other, even though it is in their best interests (if not also in the best interests of their organization and society). 2. It would not be much of a surprise if a “prisoner’s dilemma” policy environment—one with comparable sanctions and incentives—in a company or other organization isolated coworkers and colleagues from each other, fueled mistrust and unease, and unintentionally or not encouraged over-the-top “witch hunts”. …unless it also rewards caution—if not also suspicion—about the policy itself.